Trying to desperately escape the 102 degree heat outside, I drove up and down Valley Boulevard in Alhambra this afternoon, as I sometimes do, looking inside restaurant windows (and for air conditioning) to find a new place to eat. I say “sometimes” as many restaurants in my neighborhood have either Chinese or Vietnamese characters and since I don’t unfortunately read either language it is often a guessing game. The cities of Alhambra/Monterey Park have restaurant after restaurant along Valley Blvd. I’ll also play this game as I travel to other countries. You can’t beat discovering a good, crowded, local hole-in-the-wall. Here’s how it works: I peek into restaurant windows and if I see a crowd I think, “Well, it has to be good,” and venture inside. Sure, it’s a gamble, but I’ve gambled with much more in my lifetime. Today the Savoy Kitchen at 138 E. Valley Blvd., Alhambra, on the corner of Monterey, just east of Garfield Avenue, caught my eye. The small, Singaporean restaurant had about five to six wooden tables inside and many more outside. Even with the sweltering heat, all the tables outside were occupied. This was well after the lunch hour (about 3:30 p.m.). Savoy has been around since 1982 and I hear is always crowded no matter what time of day. Customers tell me there is normally a good 20 minute wait. The food is good, but honestly, not sure if I would wait that long. Luckily, I found a table right away. I looked around and immediately noticed that at every table people were eating chicken and rice. Not just one person at the table, but EVERYONE. I scan the menu, which features pastas, curries, even pizza. I find the specialty item: Hainan Chicken Rice. The rice is steamed in chicken broth. The poached chicken is served with a small portion of sweetly dark soy, chopped ginger and chili sauces. I felt like I didn’t have a choice. I had to order it. Not to feel like I succumbed to peer pressure, I added the Shrimp Roll served with their house special sweet and sour sauce. The chicken and rice is simple and tasty. Rice is moist with a hint of the chicken broth. The poaching of the chicken keeps the breast pieces juicy. I learn from the patrons around me to dip a piece of chicken into the ginger or chili sauce and eat it with a heap of white rice. Together it makes the perfect bite. Today, I came out the victor! In addition to their standard Chinese style food, Savoy also has a variety of other dishes, some inspired by Europe. The menu has a photograph of what looks like the Bay of Naples. You can order Smoked Duck, Baked Escargot with Herb Butter, Creamy Mushrooms Prosciutto Pasta, Conch and prosciutto Pasta, Italian Sausage Pizza, Smoked Duck Pizza, and Filet Mignon with Black Pepper Sauce. Open Mon.- Sat., 11 a.m.- 10 p.m. Cash only. No alcohol. Takeout. Street parking. 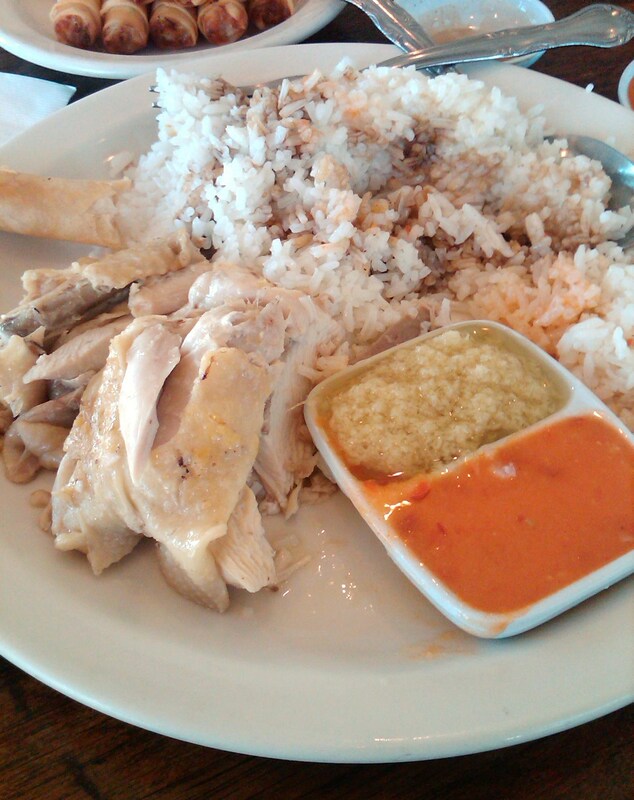 Hainan Chicken Rice, $6.95.